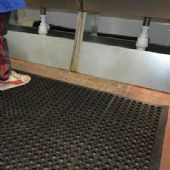 A hardwearing rubber mat which is particularly suitable for employee protection against hard floors in either wet or dry areas. Made from tough NBR rubber with a slip-resistant raised surface and drainage holes, it conforms to safety tests and is ideal for workplace use. Available in two sizes.